Nearly a month after pictures of Pakistanis wading through floodwaters began to appear on the front pages of newspapers worldwide, aid from Americans, including Jews, is beginning to arrive in the stricken country. American Jews are now responding to the call to bring relief to the devastated area, where conditions have been growing steadily worse. The monsoon rains that flooded Pakistan’s northwest region about a month ago have killed more than 1,000 people, and millions more are estimated to have been left homeless. Roads and railways have been damaged, along with schools and other civic infrastructure. The impact on the country’s crops is still being calculated and could run into the billions of dollars. The American Jewish World Service and the American Jewish Joint Distribution Committee each put out an appeal for donations last week. The AJWS, which has been working with grassroots organizations in Pakistan for years and had raised $42,000 for the Pakistan effort by the end of last week, is delivering aid bags with food, water, pots, pans, and clothes to families in the region. JDC also has worked with Pakistan before – it responded to earthquakes that hit the region in 2005 and 2008 – and the organization has allocated $20,000 from its revolving disaster relief fund that it plans to use to distribute medicine and other supplies. It hasn’t yet raised enough to cover that amount, but officials hope to meet or exceed the goal as their campaign progresses. The American Jewish Committee contributed an undisclosed amount from its humanitarian fund to the JDC effort, and a spokesman for the group said it is encouraging donors to give to JDC directly. A spokeswoman for the Israeli Consulate in Los Angeles said she knows of no aid that has gone from Israel to Pakistan during this crisis. Israel was widely applauded for its rapid response in providing aid and medical services in Haiti after the earthquake. Though the Pakistani floods have been news for weeks, Jewish groups issued their call for donations only last week. How much and how fast people donate can depend heavily on media coverage of a disaster. “The biggest challenge right now is that this has been going on for two weeks, and the media is just now starting to pay attention,” AJWS spokesman Joshua Berkman said, adding that coverage of Pakistan’s floods has paled in comparison with the attention immediately given to the Haitian earthquake. 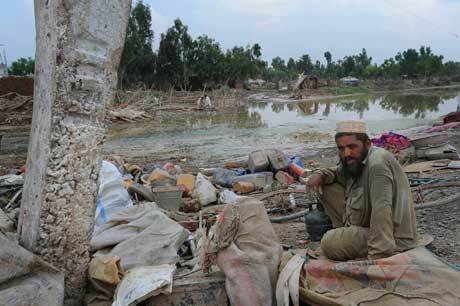 Larger, nonsectarian U.S. aid organizations are also reporting a slow response to the Pakistani flooding. “Haiti is the obvious comparison. This response is far slower,” said Susan Kotcher, vice president for development at the International Rescue Committee. Kotcher said the IRC, which made its first calls to donors on July 29, is now getting hundreds of daily donations for Pakistan and has raised a total of $1.4 million from Americans. By contrast, in the first few days after the earthquake in Haiti, the group was getting thousands of donations each day, and raised more than $4 million in the first two weeks. Some, including U.S. Secretary of State Hillary Clinton, have attributed the slow response to the economic hardships facing Americans, as well as to a feeling of fatigue among donors who have contributed to other recent relief efforts. Others say the slow response may be caused by the fact that the devastation from floods, unlike that from earthquakes and tsunamis, develops over time. “Its destructive power will accumulate and grow with time,” said U.N. Secretary General Ban Ki-moon. Asked what might account for the slowness of the Jewish response, Rabbi Harold Schulweis of Temple Valley Beth Shalom in Encino, Calif. said, “I don’t think that is an anti-Muslim deal. I think it’s a deeper question of overload” – too many issues to care about at once. American Jews are more concerned with existential threats being made against them by Iran, he suggested. To help support the relief efforts in Pakistan, visit the websites of the JDC (jdc.org), the AJWS (ajws.org) or the IRC (theirc.org).